So fab in either colour! It’s refreshing to see a boyfriend jacket that isn’t black or charcoal grey. The linen blend is especially Spring-like and the length is great for taller gals too. I loved this item on my curvy and bustier clients. Just so arty and hip. 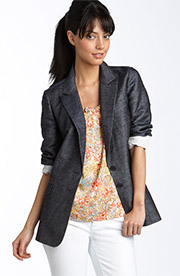 This jacket has been one of my favourite Spring items at Nordstrom so far this season. Clean, crisp and chic.